Nitrogen dioxide (NO2) and nitrogen oxide (NO) together are usually referred to as nitrogen oxides (NOx = NO + NO2). They are important trace gases in the Earth’s atmosphere, present in both the troposphere and the stratosphere. They enter the atmosphere as a result of anthropogenic activities (notably fossil fuel combustion and biomass burning) and natural processes (such as microbiological processes in soils, wildfires and lightning). During daytime, i.e. in the presence of sunlight, a photochemical cycle involving ozone (O3) converts NO into NO2 (and vice versa) on a timescale of minutes, so that NO2 is a robust measure for concentrations of nitrogen oxides. Tropospheric and stratospheric concentrations of NO2 are monitored all over the world by a variety of instruments either ground-based, in-situ (balloon, aircraft), or satellite-based– each with its own specific advantages. The TROPOMI NO2 (see figure) processing system is based on the algorithm developments for the DOMINO-2 product and for the EU QA4ECV NO2 reprocessed dataset for OMI, and has been adapted for TROPOMI. This retrieval-assimilation-modelling system uses the 3-dimensional global TM5-MP chemistry transport model at a resolution of 1x1 degree as an essential element (see ATBD for details). Data product version summary (click the highlighted version number for latest PRF). Links to the Algorithm Theoretical Basis Document (ATBD), Product User Manual (PUM), and the Product Readme File (PRF) is provided here on the right under Documentation. 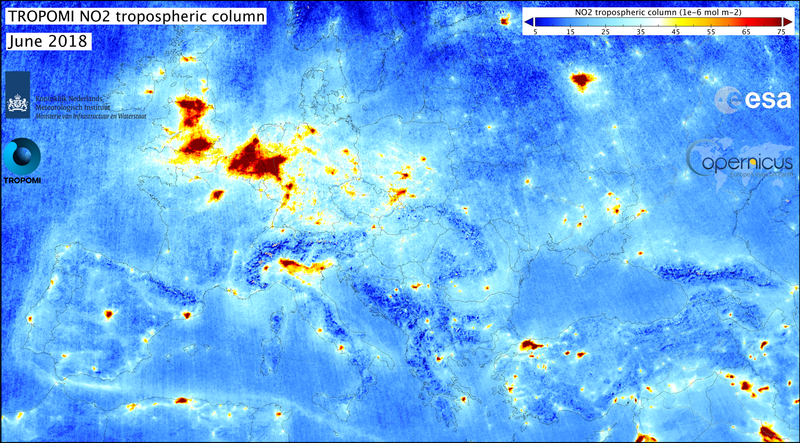 Note: both the NRTI and the OFFL versions of this data product were publically released on 11 July 2018 and are available via the Copernicus Open Data Access Hub (see link on right).